Wingtip, Cap Toe, loafers, Monk Strap, Do You Know The Difference? They say you don’t know a man until you have walked in his shoes. You could learn a lot about me, walking in mine. I appreciate my life and the journey it took me to get here. I earned my way here and am privileged enough now to have achieved great success and can wear the shoes I always dreamed of owning. Not because of the status, but because of how it makes me feel. But let’s talk about shoes. I see a lot of guys just wearing the wrong shoes. Listen, I get it. I didn’t grow up knowing this stuff either. But I saw the difference it made in the way I appeared and the way I felt when I was taking those meetings, pushing for the next level and just trying to make it happen. So, if I can help someone else with what I have learned, then I want to do it. I personally think man or woman, everyone should invest in at least one pair of nice shoes. For now, I want to talk to the men. Let me go into a few basics. Of course, there are always exceptions to the rules and depending on where I am in the world, I have broken these rules too. So, let’s just call these guidelines. Wingtip: One of my favorites, a classic shoe. The toe cap has a full brogue and is usually perforated and serrated along its edges. Most have decorative perforations on the cap. This shoe almost always has laces and is worn best with a suit. I have more than a dozen pair of these shoes in all leathers and variations especially crocodile. By far the best of the best in my opinion. Cap Toe: This is my least favorite but was really popular in Britain. It is an Oxford shoe with no seams, apart from the one seam across the toe cap. It’s always a laced up shoe and considered a staple dress shoe all men should have. It is also considered more conservative than the Wingtip. I have only one classic pair of these from Tom Ford in Crocodile, but still my least favorite. Monk Strap: This shoe style does not have any laces, but instead uses a buckle and strap to secure the shoe, and is by far one of the most beautiful shoes a man can wear and is considered moderately formal. I have mine in Crocodile and Suede and I always feel special when I am wearing these types of shoes. Loafer: This is the most casual out of this list. It is a slip-on shoe that comes in many styles from the classic loafer to the driving shoe. I have these in so many variations to pair with jeans or for summer and casual outings. When you choose an inexpensive pair of trendy shoes, it can just kill your entire look and make everything you are wearing look inexpensive and in poor taste. That can translate into communicating to a potential business partner or associate that you don’t really care, or you aren’t in it for the long run. The reality is that if you purchased a really well-made Italian shoe with leather soles and paid around $900 to $1500 for those shoes and cared for them, they can last you a lifetime. I have shoes from over 15 years ago that I still wear today, stored in their cedar shoe trees, with dust cover and original box. 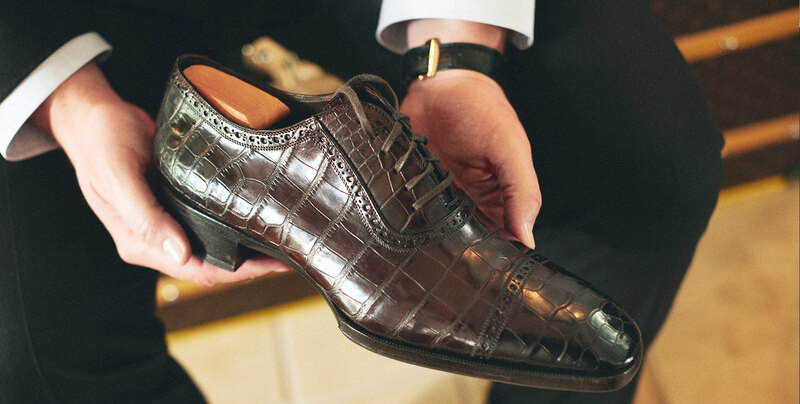 Of course, if you really have the funds and want to take it up a notch, go for the custom Tom Ford crocodile shoes that cost around $15,000 and communicate that you have both confidence and taste. If you want something that will last, go for timeless style. An elegant, quality shoe will last a lifetime if you take care of it. For me, I have been obsessed with crocodile shoes in monk strap and loafers. Whatever you do, always be you, always be true to your style and your preference. Just remember that the shoes you wear is also telling a story. Just make sure that is the story that you want to tell.